WASHINGTON (Dec. 10, 2010) -- Cadets from the U.S. Military Academy at West Point stormed the Pentagon Dec. 10 to rally support for the Black Knights in advance of Saturday's football game against Navy's Midshipmen. The Dec. 11 Army-Navy matchup in Philadelphia pits the West Point football squad against the United States Naval Academy's Midshipmen for the 111th time since 1890. 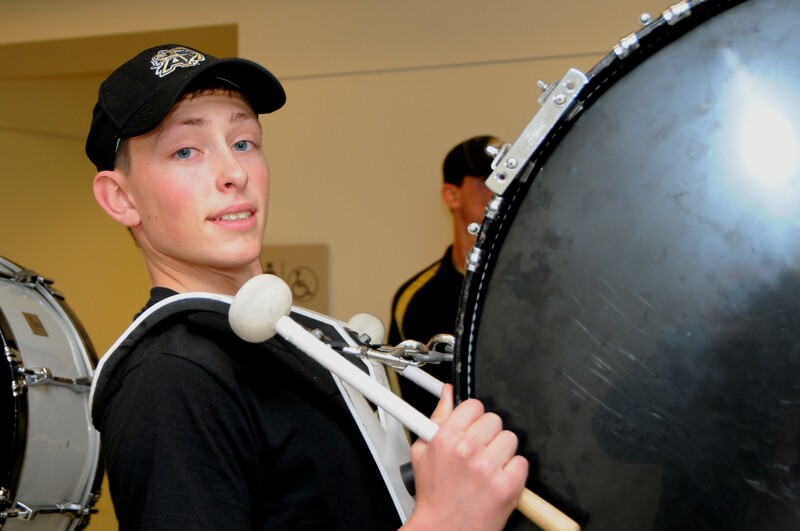 Cadet Jake Severn, a drummer with the United States Military Academy Pep Band, is in his first year at West Point. He participated Dec. 10 in a pep rally at the Pentagon to support the school's Black Knights football team in advance of the Dec. 11 game against the Navy academy's Midshipmen. It was cadets from the United States Military Academy Pep Band and school's 'Rabble Rousers" cheerleading team that nosily made their way through the normally sedate halls of the Department of Defense's headquarters building. The group completed their tour of the building in the Army's executive corridor, where they found home-team support from Chief of Staff of the Army Gen. George W. Casey Jr., Secretary of the Army John McHugh and other Army four-star generals. "Nine is the Navy's unlucky number, their ship is going to sink tomorrow and there'll be a sea of tears on which they can sail back to Annapolis -- Army strong!" said McHugh. "Give them hell tomorrow and we'll be up there with you, God bless you and good luck." The chief of staff was even shorter on words than the secretary. Shaking his fist in the air, Casey predicted an end to the Navy's winning streak. "It stops at eight," he said. Brianna Perez, in her third year at the school, was one of the cheerleaders that walked the halls of the Pentagon drumming up support for the big game. She said she's sure the Army will take home the trophy this weekend for the first time in over eight years. "Our season's been great," she said. "We're definitely going to win, there's no doubt about it. This is the year." 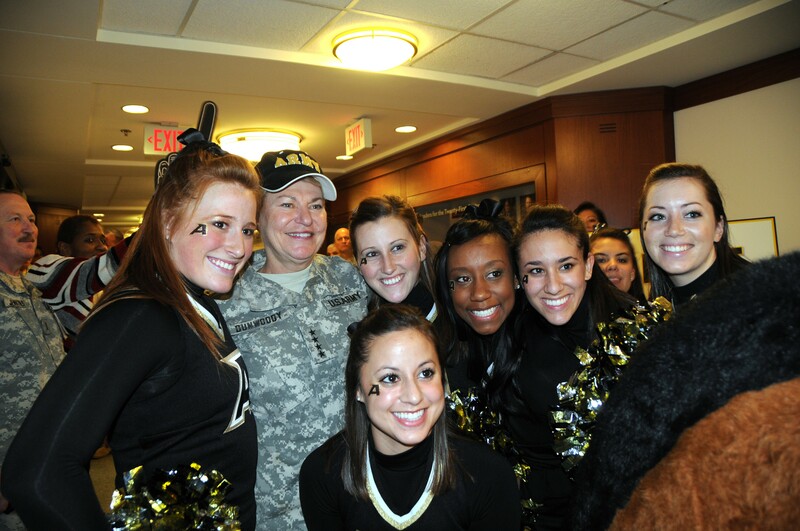 Gen. Anne E. Dunwoody, commander of U.S. Army Materiel Command, met with female cadets from the U.S. Military Academy at West Point, Dec. 10 at the Pentagon. The students were in at the building to drum up support for the school's Black Knight's football team, in advance of their Dec. 11 game against the Navy. Dunwoody is the first woman in the Department of Defence to achieve the rank of four-star general. From Long Beach, Calif., Perez said after she graduates and gets her commission, she's considering the engineering or military police branch for her service in the Army. Louisa Anchondo, also a member of the Rabble Rousers, is in her third year of school. She's also confident about the Black Knight's prospects. "The Army's going to win this weekend because we have a lot of heart and we're going to play our best -- and we're going to do so well," she said. Anchondo, from Lockhart, Texas, said she expects to go into military intelligence after she is commissioned. Connor Green, from Fort Hood, Texas, is a sophomore at West Point, and is one of the male cheerleaders rooting for the Army to beat Navy in Philadelphia. "Last time we beat Navy we went to a bowl game, it's a sign," he said. Cadets from the U.S. Military Academy at West Point stormed the Pentagon Dec. 10 to rally support for the Black Knights in advance of Saturday's football game against Navy's Midshipmen. The Army team is scheduled to compete against the Southern Methodist University Mustangs, Dec. 30, in the Armed Forces Bowl. The last time the Army competed in a bowl game -- the Independence Bowl against Auburn University in 1996 -- they also beat Navy. Green said he wants to go into infantry or armor after he is commissioned as a lieutenant. One of the drummers in the cadet band, Jake Severn, is in his first year at West Point. He said he knows the Army team is ready to take on Navy this year. "I've watched them play every game -- they're ready to beat Navy," he said. "This is the year, and we're going to overturn the Navy's streak." Severn, from Florida, said he's considering field artillery, military intelligence or infantry as a branch when he is commissioned. The cadets from West Point spent a little more than two hours marching through the Pentagon, playing music and drumming up excitement for the game. They started at the office of the Secretary of the Navy, then moved on to the Office of the Chairman of the Joint Chiefs of Staff as well as the offices of the secretary and deputy secretary of Defense. In the history of the Army-Navy football competition, Army has won 49 games, lost 54, and tied seven times. In the 2009 matchup, Navy beat Army 17-3. The last time the Army won the game was in 2001.